I saw my first leaf frog in the wild about 15 years ago. I was in a Jacuzzi pool at a hotel in Tortuguero National Park in Costa Rica. I was relaxing there one evening with my wife and another guest who was a Tico – a local. It was my first experience at cultural exchange so I was enjoying the conversation, which thankfully was mostly in English. I felt like I was getting some insider information on the country that might make our trip more authentic or exciting. Ahhhh naiveté. Two things I most remember about that moment: the Tico had this fascinating habit of ending near every English sentence in ‘verdad’. The Spanish equivalent of ending sentences with ‘right?’ That took me a bit to figure out. The second was that like most Costa Rican pools outside of the capitol city this one was surrounded by vegetation and smack in the center was a raised planter filled with ornamentals and heliconia. And in the heliconia were clucking red-eye tree frogs, Agalychnis callidryas. 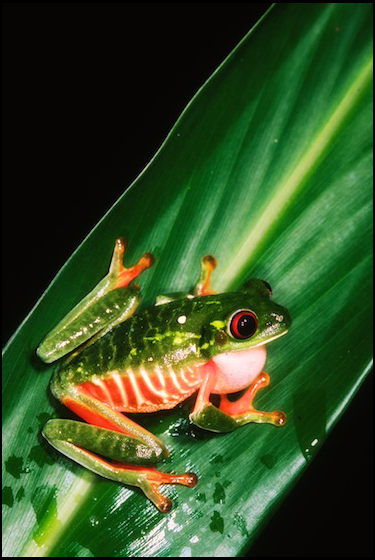 The photogenic and brilliantly colored red-eye tree frog from Costa Rica may be photographed more than any other animal. 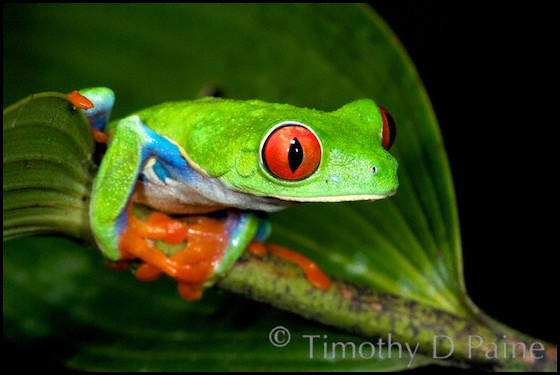 Red-eye tree frogs are an extremely charismatic animal. Their images grace calendars, postcards, t-shirts, coffee mugs, paintings, and are used for just about every conceivable commercial advertising purpose. In fact the opening credits of my scanning software used to scan old slides for this piece is graced with a red-eye tree frog. By far they are the most photographed frogs in the world and some claim they are the most photographed vertebrates in the world. The Pacific slope forms of Agalychnis callidryas lack the stunning blues, yellows, and purples found on the Atlantic forms. Their sides are striped in browns and oranges and some may consider them a separate species. So despite my excitement I feigned simple curiosity and resumed conversation. I never took pictures of my first leaf frogs. Over the years I’ve made many trips to Costa Rica interspersed with a bunch of trips to South America. And I’ve come across numerous species of frogs, so much so that I’ve kind of made it a practice to ignore the gaudy yet stunning frogs that everyone is so familiar. I’ve poked around for them. I’ve watched breeding aggregations on both the Pacific and Atlantic versants of Costa Rica and still enjoy finding them. It’s just from a photographic standpoint I’ve sort of had a ‘why bother’ attitude. Mostly. I had a special moment shooting a stunning example in the mountains overlooking the Caribbean plain. There was the night I was poking around a pond south of Quepos and shot a calling male for austerity. And I needed calling frog shots. And Pacific A. callidryas look very different from their brethren over the Talamanca. Great post Tim! Loved the shots. Beautiful; well done and very interesting. Beautiful photos and wonderful information…Thanks for sharing your experiences with us Tim…. Tim, these are some of the most stunning photos of Phyllomedusinae I have yet to come across. Keep up the great work!!!.. Peter, thanks for the compliments. I’m trying. Waaaay behind on the blog work as I’ve given to some other writing assignments but hoping to tap out more in 2014.